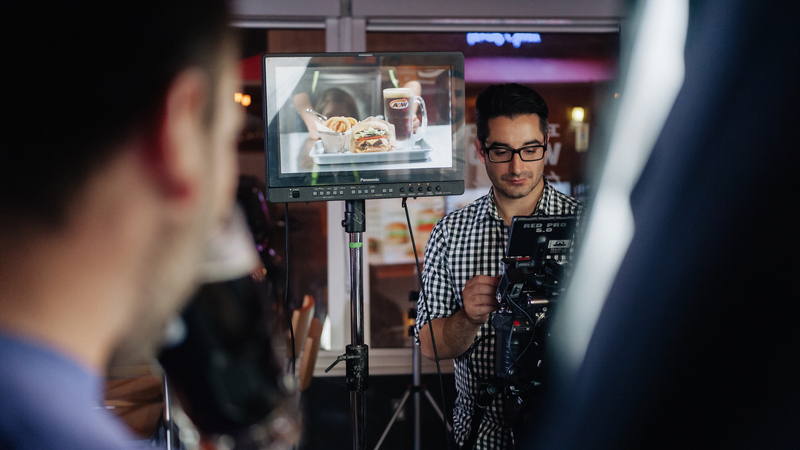 For one delicious evening we took over an A&W to create approximately 40 seconds of content. Given the size of the restaurant and our 10 hour production window, we felt a micro crew was the way to go. This meant intensive pre-production which included: A location scout, storyboards, a slew of test shots, light & lens experimentation and plenty of chats with our director of photography and food stylist. Given the budget, production values and online results, it’s safe to say A&W’s foray into short form video advertising was beefy. Currently the ads have accumulated over 4 million views, 13,000 likes and 1,500 shares, not to mention a whack of consumer engagement. Just Kidding. This one’s our favourite. Most film sets are a practice in stamina. This one was no exception as we had to do this overnight! Fortunately, the Dan Rascal crew are amazingly professional and inspiring to work with. While keeping serious, they also know how to share a laugh or two. Working with food can sometimes be finicky, but with the right tricks you can make something as ordinary as a fast food burger look picture perfect. Fun fact! I only used A&W ingredients (with the exception of some olive oil to gloss the tomato and bacon every now and then). The blowtorch was used to make sure the burger looked perfectly charred and plump. Overall it was to give it a ‘fresh off the grill’ vibe even though it would have to sit under lights for a few hours. Other than that, a few careful placements of tooth picks and a squeeze bottle or two for garnishing completed the look.